Marwah, N., Rana, S., Jain, P., Gupta, S., Marwah, S., Sen, R. (2013). A Fine Needle Aspiration Study of the Abdominal Cutaneous and Subcutaneous Nodules. Iranian Journal of Pathology, 8(2), 97-103. Nisha Marwah; Shweta Rana; Promil Jain; Sumiti Gupta; Sanjay Marwah; Rajeev Sen. "A Fine Needle Aspiration Study of the Abdominal Cutaneous and Subcutaneous Nodules". 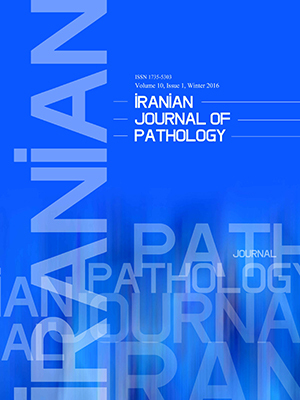 Iranian Journal of Pathology, 8, 2, 2013, 97-103. Marwah, N., Rana, S., Jain, P., Gupta, S., Marwah, S., Sen, R. (2013). 'A Fine Needle Aspiration Study of the Abdominal Cutaneous and Subcutaneous Nodules', Iranian Journal of Pathology, 8(2), pp. 97-103. Marwah, N., Rana, S., Jain, P., Gupta, S., Marwah, S., Sen, R. A Fine Needle Aspiration Study of the Abdominal Cutaneous and Subcutaneous Nodules. Iranian Journal of Pathology, 2013; 8(2): 97-103. Background & Objective: Abdominal cutaneous and subcutaneous nodules are uncommon lesions which may be benign or malignant. Majority of the malignant nodules are metastatic in origin and may be the initial presentation of primary malignancy, hence an early diagnosis is important. Our aim was to find out the spectrum of lesions (both non-neoplastic and neoplastic) that present as cutaneous and subcutaneous abdominal wall nodules and to assess the efficacy of fine needle aspiration cytology (FNAC) in early diagnosis of all such lesions so that need for histopathology can be minimized. Material and Methods: The study was conducted on 46 patients of all age groups, presenting with various palpable cutaneous and subcutaneous abdominal wall nodules. FNAC was performed, smears stained with May Grunwald- Giemsa stain and Pap stains. Special stains were applied wherever required. Cytological diagnosis was subsequently correlated with histopathological diagnosis. Results: Out of 46 FNAC cases ; there were 13 non-neoplastic lesions, 15 benign neoplasms and 17 malignant lesions. One case was inadequate for opinion that on histopathology turned out to be metastatic deposits from renal cell carcinoma. The rate of unsatisfactory FNAC was 2.2% and the sensitivity was 89.47%. The specificity and positive predictive value was 100%. Conclusion: FNAC is a simple, minimally invasive, highly accurate and cost effective technique for quick diagnosis of malignant metastatic abdominal wall nodules, thus minimising the need for histopathology and for deciding mode of treatment. David O, Kluskens L, Reddy V, Gattuso P. Malignant cutaneous and subcutaneous abdominal wall lesions: A fine needle aspiration study. Diag Cytopathol 1998;19(4): 267-9. Srinivasan R, Ray R, Nijhawan R. Metastatic cutaneous and subcutaneous deposits from internal carcinoma. Acta Cytol 1993;37(6):894-8. Lookingbill DP, Spangler N, Helm KF. Cutaneous metastatic carcinoma: a retrospective study of 4020 patients. J Am Acad Dermatol 1993;29:228-36. Rosen T. Cutaneous metastases. Med Clin North Am 1980:65:885-900. Sahai K, Kapila K, Verma K. Fine needle aspiration cytology of umbilical nodules: “Sister Joseph’s nodule.” Diag Cytopathol 2001;25(5): 309-10. Aich RK, Karin MR, Chakraborty B, Gupta SD, Deb AR. Sister Mary Joseph’s Nodule. Indian J Med Paediatr Oncol 2008;29(2):40-3. Parate SN, Sankalecha SM, Anshu, Munshi MM, Bobhate SS. Utility of fine needle aspiration cytology in skin tumours. J Cytol 2003;20(4):180-4. Daskalopoulou D, Galanopoulou A, Statinopoulou P, Papapetrou S, Pandazis I, Markidou S. Cytologically interesting cases of primary skin tumors and tumor-like conditions identified by fine needle aspiration biopsy. Diag Cytopathol 1998;19(1):17-28. Inwood MJ, Thomson S. Basic hematologic techniques. In: Raphael SS, editor. Lynch’s medical laboratory technology. 3rd ed. Philadelphia: WB Saunders; 1976. p. 1073-129. Culling CFA. Histology. In: Raphael SS, editor. Lynch’s medical laboratory technology. 3rd ed. Philadelphia: WB Saunders; 1976. p. 916-33. Layfield LJ, Glasgow BJ. Aspiration biopsy cytology of primary cutaneous tumors. Acta Cytol 1993;37(5): 679-88. Spitz DJ, Reddy V, Selvaggi SM, Kluskens L, Green L, Gattuso P. Fine needle aspiration of scalp lesions. Diag Cytopathol 2000; 23(1): 35-8. Patnayak R, Kalyani D, Rao IS, Prayaga A, Sundaram C, Jena A. Cysicercosis: The hidden parasite with short review of literature. The Internet Journal of Infectious Diseases. 2007;6(1):DOI: 10.5580/1ac2. Edoute Y, Malberger E, Kuten A. Umbilical metastasis diagnosed by fine needle aspiration. J Surg Oncol 1990; 45: 56-8. Handa U, Garg S, Mohan H. Fine needle aspiration cytology of Sister Mary Joseph's (Paraumbilical) nodules. Diag Cytopathol 2008;36(5): 348-50. Deb P, Rai RS, Rai R, Gupta E, Chander Y. Sister Mary Joseph’s nodule as the presenting sign of disseminated prostate carcinoma. J Cancer Res Ther 2009;5(2):127-9. Shukla P, Gupta D, Bisht SS, Pant MC. Ovarian adenocarcinoma in a young female with skin and umblical metastasis. Indian J Med Paediatric Oncol 2009;30(4):144-6. Gupta RK, Naran S. Fine needle aspiration cytology of cutaneous and subcutaneous metastatic deposits from epithelial malignancies. Acta Cytol 1999;43(2):126-30. Reyes CV, Jensen J, Eng AM. Fine needle aspiration cytology of cutaneous metastases. Acta Cytol 1993;37(2);142-8. Fratellone PM, Holowecki MA. Forgotten node: A case report. World J Gastroenterol 2009; 15(39): 4974-5.